Eighteen-year-old Linsday Bedford has lived with her Amish aunt and uncle in Bird-in-Hand, Pennsylvania ever since her parents died in a car accident. While she’s settled into the Amish way of life and enjoys working in the family bakery and helping to care for her younger cousins, her older sister, Jessica, lives with a family friend back home in Virginia and is pursuing a college degree. Lindsay thinks that she’s settled in her new lifestyle, until her sister comes to visit and encourages her to experiment more in the English world that she grew up in and see all that she’s missing out on. As much as Lindsay enjoys life in Bird-in-Hand, she can’t help but wonder whether she’s letting her real parents down by not pursing a college degree and a career like her sister. So instead of taking baptismal classes with her friends, she spends the summer staying with Jessica’s legal guardians and caring their “Aunt”, who has broken her leg. But although the temptations of the English world are all around her, Lindsay feels uncomfortable wearing the typical beach clothes everyone in Virginia is wearing, attending rowdy parties with her old school friends and eating off paper plates in front of the television. As her old friends and neighbours question the way of life she’s been living with her aunt and uncle back in Pennsylvania, Lindsay also questions the route she’s meant to take in her life. Does God want her to be career-motivated like Jessica? Or is her contentment in Bird-in-Hand a sign that she’s meant to stay there? 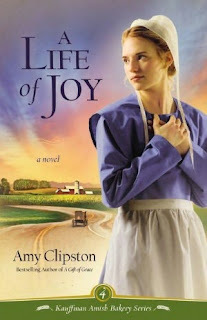 Next to Beverly Lewis, Amy Clipston was the first Amish author I ever read. The first book in her Kauffman Amish Bakery series appealed to me because it wasn’t a standard romance, but the tale of two orphaned English teenagers who came to live with the childless Amish uncle and aunt. A Life of Joy revisits these teenagers, who are now young women, and follows Lindsay as she figures out which path in life she’s destined to take. This novel differs from a lot of other Amish novels in that at least half of it takes place in the “English” world in Virginia, where Lindsay is staying with family friends. But despite the lack of buggies and prayer kapps, Amy has crafted an incredibly compelling story. There’s a little romance in the background of the story, kept alive through letters and phone calls between Lindsay and a male friend back in Pennsylvania, but the main body of the story deals with Lindsay finding herself. Any woman who has felt torn between the life God wants her to lead and that which the world and her peers think is best for her will be able to relate to Lindsay’s struggles. This book came at just the right time for me, so I may be a little biased in my review. I’ve known since I was a teenager that all I want to do in life is get married and have a family. I’d love nothing more than to be a stay-at-home mum; but right now the fact that I’m getting married this summer rather than pursuing an internship or searching for work experience bemuses my fellow classmates. I’m not driven like they are when it comes to career matters, but they don’t always understand this; just like Jessica doesn’t understand how her sister can enjoy baking pies and babysitting her cousins over going to college. I could completely empathise with Lindsay feeling pulled towards the English world even though she was normally content being Amish. Sometimes the pressures of friends and family make us feel like we’re not doing enough, just because we’re taking the path that most avoid. Reading about Lindsay’s search for the place she was meant to be and the role she was meant to inhabit truly encouraged me, and I hope it does the same for many other readers. This is the fourth novel in the Kauffman Amish Bakery series, and unlike some books in the Amish genre I don’t think it can be read as a standalone. That said, long-term fans of Amy’s novels will be pleased to revisit characters like Lindsay and Jessica, as well as their aunt and uncle, in this novel. Characters from the second and third instalments in the series also appear in the background from time to time, as do popular locations such as the bakery and furniture store. But just as this book follows on from earlier instalments in the series, the ending left me wondering if Lindsay and Jessica’s stories were going to be concluded in the fifth and final book. I turned the page on my Kindle expecting another chapter or an epilogue to find discussion questions and had to go back and reread the last paragraph, surprised at how abrupt the ending was. While it was optimistic for Lindsay, I couldn’t help but feel that Jessica’s story wasn’t finished yet, and there were some unanswered questions regarding Lindsay’s aunt and one of her friends. I do hope that Amy plans to answer these questions in the final book in the series, and since she’s announced that she’ll be writing a YA spinoff of the Kauffman Amish Bakery series perhaps this will revisit some of Lindsay’s teenage friends. The fourth novel in the Kauffman Amish Bakery series is just as delightful as those that came before it, and many readers will be able to relate to Lindsay’s struggles to discover her place in life. Long-term fans of the series will be pleased to revisit old favourite characters in A Life of Joy and will be left greatly anticipating the fifth and final instalment, A Season of Love. Review title provided by Zondervan. What a great review! Thank you! I don't normally read Amish books but I really enjoyed Amy's first one for the reasons you said. I'd love to read this one and see Lindsay's story. If you liked 'A Gift of Grace' then you'll definitely enjoy this book! A lot of it was set in Virginia, where Lindsay grew up, and while it was strange reading about an Amish girl in an "English" setting, it was kind of a reversal of the typical Amish plot - English girl visits Amish country. Thank you! I'm sure there are plenty of other women with the same dreams as me, just not that many at the University of St. Andrews. I have my friends back home who are wives and mums to keep me sane and not worry too much about my dreams :) It's definitely what God has placed on my heart!